The first 2500 fans at Richmond County Bank Ballpark on August 19 will receive this limited-edition collectible. Former New York Yankee prospect and current Seattle Mariner secret weapon Pat Venditte will be fondly remembered by the Staten Island Yankees on August 19th when the Yanks Class A Short Season affiliate host Pat Venditte “Switch-Pitcher” Bobblearms Giveaway Night. Venditte made his pro debut for the “Baby Bombers” against the Brooklyn Cyclones on June 19, 2008. With two outs and a runner on first in the bottom of the ninth inning, a switch-hitter came to the plate representing Brooklyn’s last hope. He entered the batters box batting right-handed, so Venditte switched his glove to his left hand. The hitter then decided to bat lefty, so Venditte switched his glove back to his right. After a prolonged delay switching sides at the plate, the hitter was ordered to bat right-handed. Ambidextrous pitcher Venditte then struck out the batter on four pitches to end the game and secure a Yankees win. Two weeks later on July 2nd after consulting with the Major League Baseball rules committee, the Professional Baseball Umpire Corporation announced what has become known as the Venditte Rule: A switch-pitcher has to declare which hand he is going to use first. It ultimately afforded opposing managers the luxury of knowing the pitcher’s hand. Toronto manager John Gibbons signals for switch-pitcher Pat Venditte from the Blue Jays bullpen. Selected by the New York Yankees in the 20th round of the 2008 draft, the Omaha native spent seven seasons in the Yankees’ farm system before signing a minor-league deal with Oakland. After an impressive 1.55 ERA with 40 strikeouts at AAA Nashville, the proud Italian American made his MLB debut with the A’s on June 5, 2015. He finished the season with a 2-2 record and a 4.40 ERA. Toronto claimed Venditte off waivers during the off-season, and the 31-year-old was traded to Seattle on August 6th. Your browser does not support iframes. 39-year-old Jason Grilli is better than ever in Toronto. Just ask former Jays manager Cito Gaston about the current team’s roster, which now boasts veteran Italian American pitcher Jason Grilli as their reliable setup man. Just two games out of first in the American League East Division, the Blue Jays would like nothing more than ending the 23-year-old drought by bringing a World Series title back home to Toronto. Gaston said, “I think they have the team to win it. It’s going to be fun, and it’s going to be fun for this city to watch.” Since being traded on May 31st from the Atlanta Braves, Jason Grilli has provided the necessary leadership to propel current Toronto Blue Jays skipper John Gibbons’ team to the top. The trade that brought Grilli north of the border probably would have never taken place without a little help from Blue Jays catcher Russell Martin, who encouraged the front office to take action and served as catcher for Grilli while with the Pittsburgh Pirates in 2013 when Jason earned a nod to the National League All-Star squad. 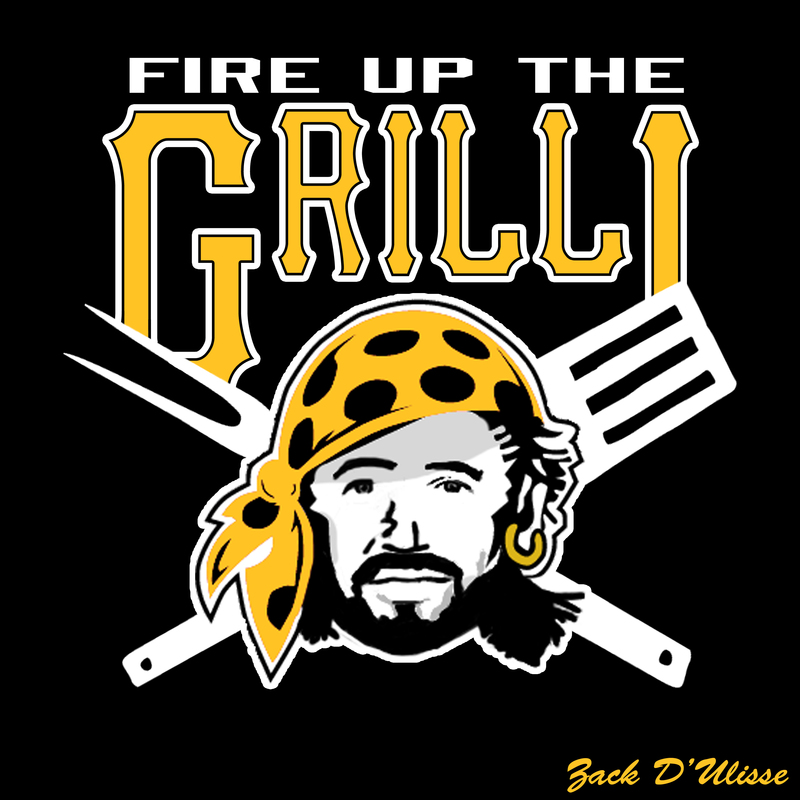 Like a fine Italian wine getting better with time, Grilli saved 33 games and posted a 2.70 ERA with 74 strikeouts to just 13 walks for the Pirates that year. His accolades grew larger in 2014 when the National Italian American Sports Hall of Fame honored Pirates closer Jason Grilli as the “Man of the Year”. Jays General Manager Ross Atkins cited Martin’s endorsement of Grilli as being a factor in bringing him to Toronto. Pitcher Jason Grilli and catcher Russell Martin have reunited to bring another World Series title to Canada. Martin admitted Grilli is now getting by more on craft and guile than power. “His arm is still electric. There’s still some bullets in that thing,” Russell said. “He’s got that fastball that guys like to swing at when it’s up in the zone. 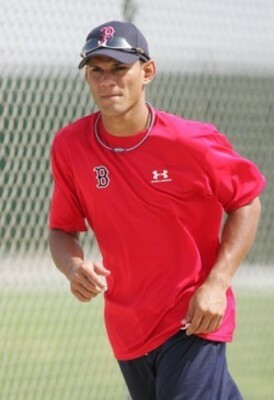 He knows how to disrupt timing with the slide-step, how to elevate the fastball. And he’s got a really tight slider — one of the best that I’ve caught.” Jason has made fifteen appearances for Toronto, tossing 13.2 innings, allowing ten hits and six walks while striking out 23. Grilli has also notched four holds since joining the Blue Jays. 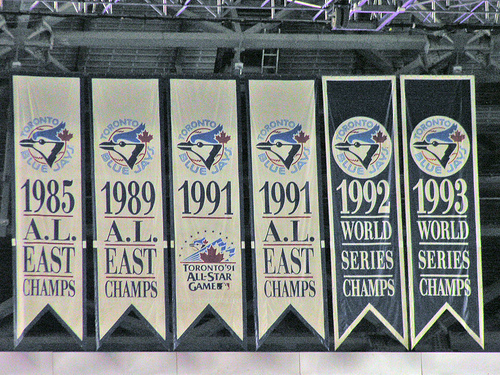 The Blue Jays won the World Series in 1992 and 1993. 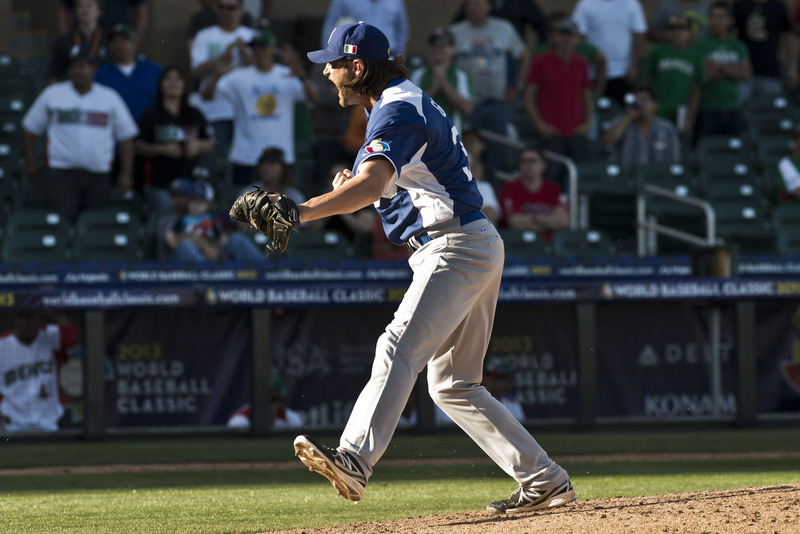 Jason Grilli shuts the door and gets the save for Team Italia against Mexico in the 2013 WBC. Jason Grilli’s Just My Game, co-written by Todd Civin, is mandatory reading for baseball lovers worldwide. Not only do both former MLB All-Stars share a common first name, but coincidentally they have published two new must-read books at the same time. 2013 National League All-Star / Pittsburgh Pirates’ closer Jason Grilli and seasoned veteran catcher Jason Kendall are best-known for their delivery on the mound and calling the game behind home plate. However, let the world know that they also possess a knack for writing good stories. 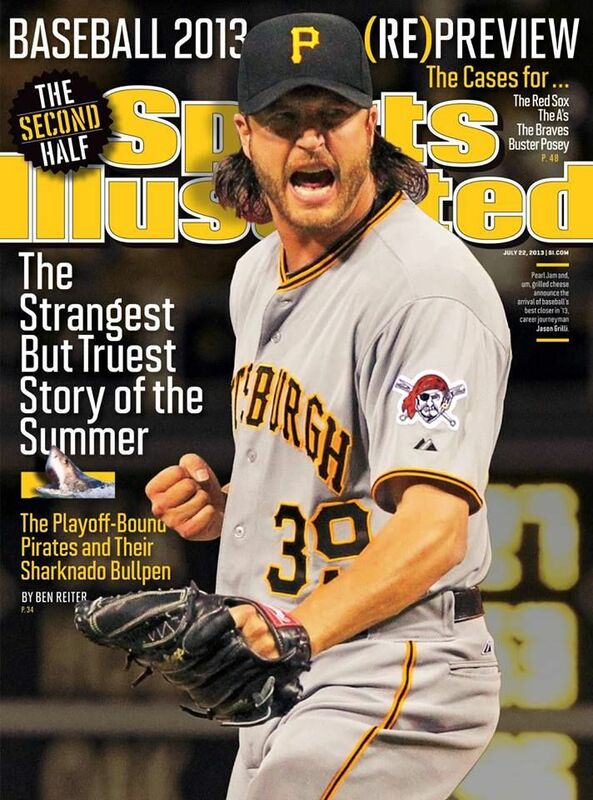 Initially, Grilli was reluctant to share with fans his personal journal which eventually turned into a book. 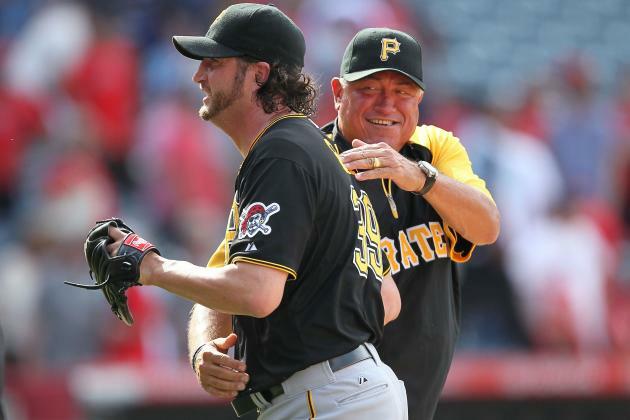 Pittsburgh Pirates manager Clint Hurdle wrote the foreword for Jason Grilli’s new autobiography. 2013 playoff run. Jason Grilli will be making several book signing appearances in the coming months in support of the launch of his long-awaited autobiography. Be the first to purchase Just My Game before it goes on sale to the public by visiting Jason Grilli’s Facebook. Readers will be pleasantly surprised to find the eloquent foreword to Grilli’s book written by 2013 National League Manager of the Year and Pirates’ skipper Clint Hurdle. Known to be a proponent of the power of positive thinking, Hurdle is the perfect setup man for Grilli’s autobiography. Hurdle has been busy of late reading Jason Kendall’s Throwback, which was co-written by sportswriter Lee Judge. 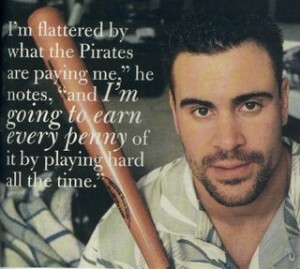 Jason Kendall was the Pirates’ #1 draft pick in 1992. Prince Fielder holds back an emotional Jason Kendall. America’s favorite pastime has always left fans and amateur players alike yearning for the answers to questions about how pros play the game. Have you ever wondered about pre-game rituals, what is being said at home plate, the signs a catcher uses to communicate with the pitcher, how a team silently communicates and the right way to hit a batter or what goes on behind closed clubhouse doors? All-Star catcher Jason Kendall is more than qualified to shed some light on the subject using his 15-years playing behind home plate with the Pittsburgh Pirates, Oakland Athletics, Chicago Cubs, Milwaukee Brewers, and Kansas City Royals as a true testament. Toronto Blue Jays manager John Gibbons summed it up nicely when he characterized Kendall and his new book as winners. 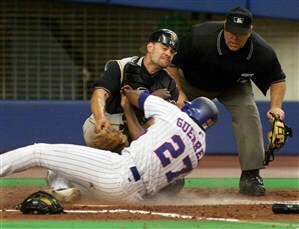 Vladimir Guerrero collides with Jason Kendall. Gibby said, “Jason Kendall is the ultimate competitor, a modern-day gladiator. 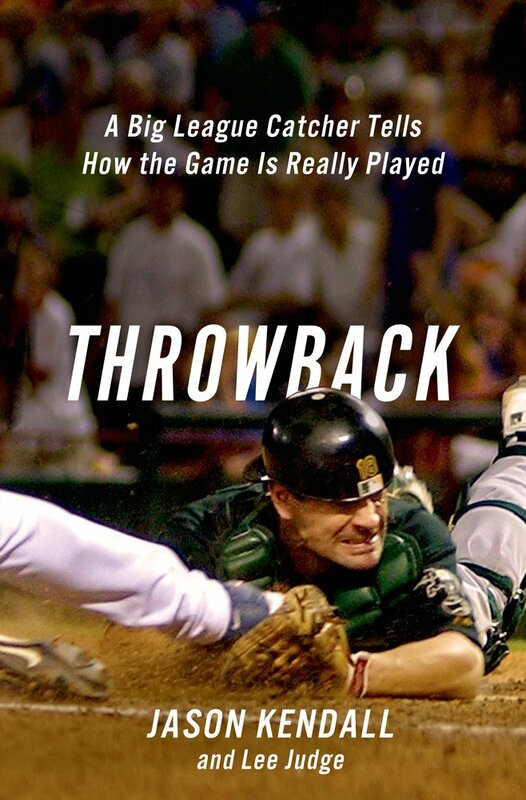 If you had nine Jason Kendalls, you could never lose.” Undoubtedly, Throwback provides readers an opportunity to gain an insider’s view of the game from a true-grit player’s perspective. Coupled with Jason Grilli’s new offering of Just My Game, baseball fanatics now have a winning combination of required reading guaranteed to bring hours of enjoyment and a fonder appreciation of what makes these players truly inspirational. Although half of MLB.com Jonathan Mayo’s 2011 Top 10 Outfield Prospects have made their splash into Major League Baseball, the remaining five prospects–including former Boston Red Sox 2009 first-round draft pick and current Padres AA-affiliate San Antonio Missions leadoff hitter Reymond Fuentes–have yet to make their grandiose MLB debut despite possessing the five-tools necessary to become successful in the big leagues. in exchange for Adrian Gonzalez. Reymond Fuentes scored twice in Puerto Rico’s 8-4 victory over U.S.A in the 2011 World Cup. 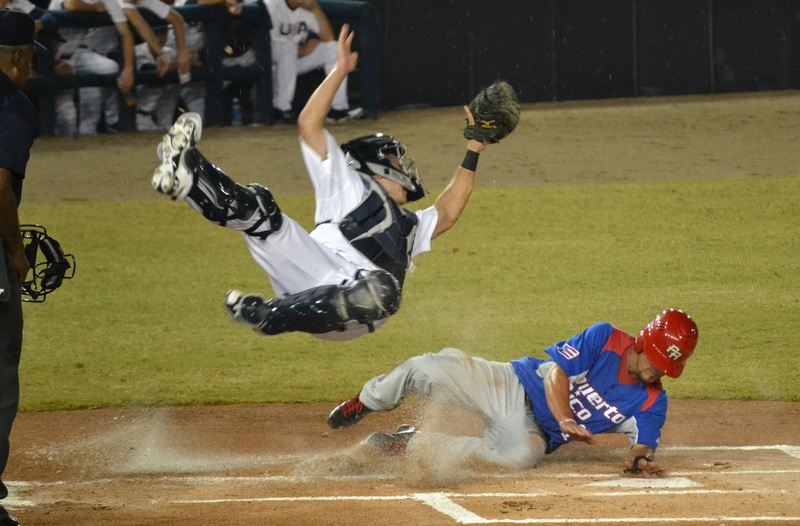 Puerto Rico’s Reymond Fuentes steals a bag in the 2011 Juegos Panamericanos against Cuba. 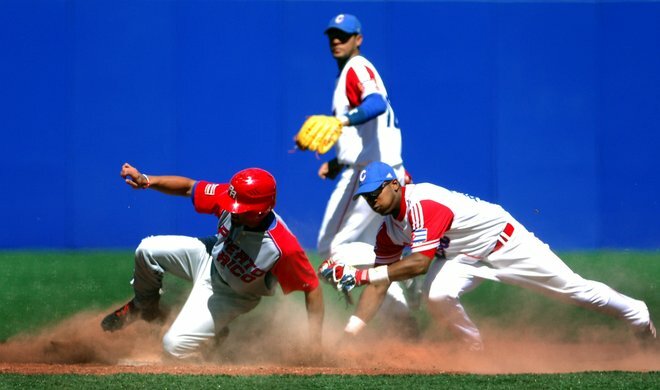 Part of Team World’s outfield with current MLB players Dayan Viciedo (Chicago White Sox) and Starling Marte (Pittsburgh Pirates) in the 2011 All-Star Futures Game, Reymond Fuentes was one of two prospects selected from the San Diego Padres organization. Named the Friar’s #13 prospect by MLB.com and rated the franchise’s best baserunner by Baseball America following a successful 2011 at Single-A Advanced Lake Elsinore with 41 stolen bases, Fuentes has been the spark plug for the 2012 AA San Antonio Missions. We caught up with Fuentes recently in San Antonio at Wolff Stadium after the post-game fireworks, which the youthful Reymond kindly requested to watch before conducting the interview. Roberto: You look good having put on 15 pounds of muscle during the offseason for additional power without compromising your lightning speed. With teammate Dean Anna having a great 2012 season and sometimes leading off, Missions’ manager John Gibbons has switched up the line-up and placed you in different slots. Do you care where you are placed in the line-up? 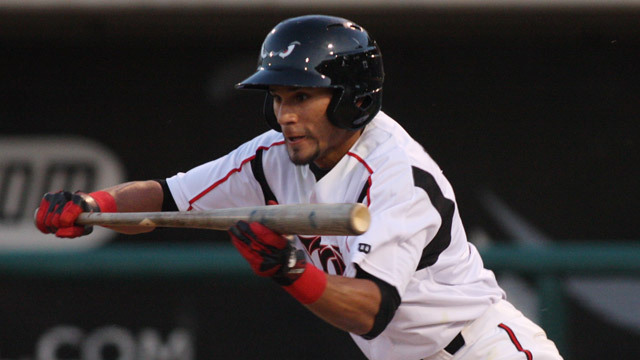 Fuentes’ speed on the bases and in the outfield led Lake Elsinore to a 2011 Cal League Championship. do it. Just follow orders from my manager and just play the game that I love and know how to do. Roberto: As the Missions’ team leader for stolen bases on par for 30-plus in 2012, do you enjoy making the opposing pitcher worry about you when you are on the base paths? Roberto: Having an eagle eye vantage point of all the action on the field, do you like playing center field? Reymond Fuentes: Center field is awesome. My speed and my range help me a lot. It’s fun just to run down balls and get those hits off the other team. And get them angry a little bit…you know what I mean. It’s a lot of fun tracking balls and making those diving catches is the best! So I love center field, and I wouldn’t change it for anything else. 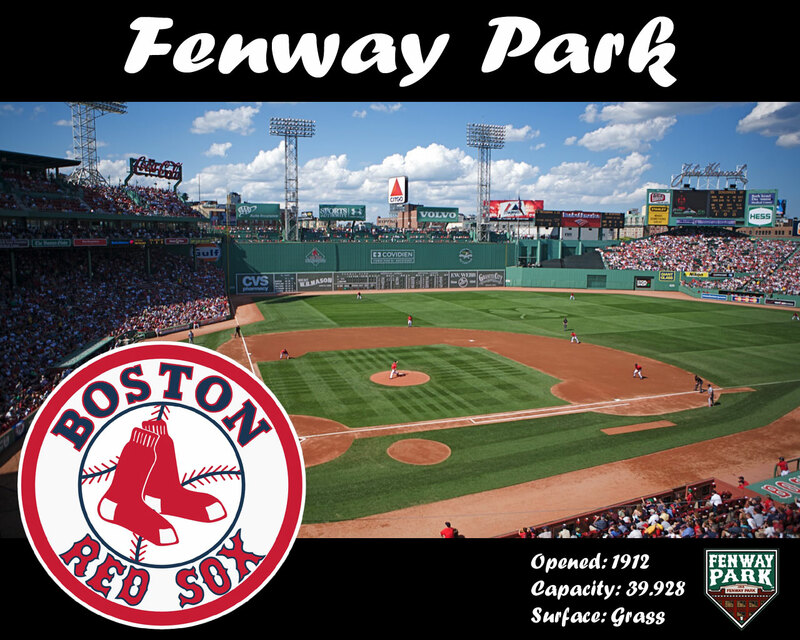 Roberto: After being involved in the trade that allowed Boston to acquire Adrian Gonzalez from San Diego, was there any love lost when you had to say goodbye to Fenway? was really tough not to see my old teammates from Boston, but I mean being traded for Adrian is a huge step for me. I mean Adrian is an All-Star. He’s a great player. I think it’s a real honor to get traded for him and just join this team, play the game with the same attitude and effort in Boston here. Roberto: Please tell me about your deep family connections to Major League Baseball. 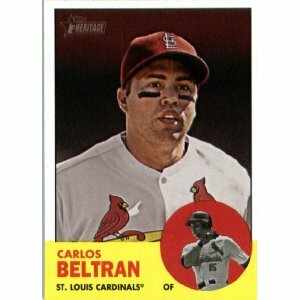 Reymond Fuentes: Carlos Beltran is my mom’s cousin. We work out in the offseason everyday–hitting, fielding, throwing, catching. He’s a great guy. He taught me a lot on the field and off the field. He’s taught me a lot of stuff about life so I have to thank him. My dad used to play too. He’s been there since I was four years old. He was the first one who gave a bat to me and saw me swing. So I have to thank my dad for staying with me all this time and help me get where I am right now. Roberto: How influential was the legendary Roberto Clemente growing up in Puerto Rico? Reymond Fuentes: Roberto Clemente, God rest his soul, was a terrific, all-time I don’t even know how to describe…he was a great player! A lot of little kids including me looked up to him because the way he played ball, the love he had for the game. It was unexplainable. I love to read his articles because I didn’t get to see him play. 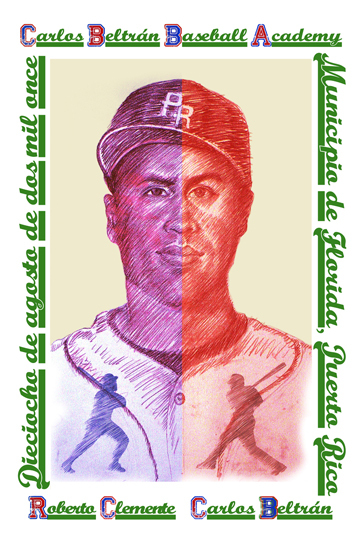 But everything I read about him is awesome, and he’s the best of Puerto Rico right now. 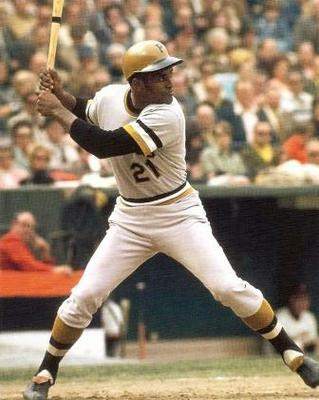 I used to wear (Clemente’s) number 21 when I was a little kid. Then I couldn’t use it because of some rules in Puerto Rico when they retired his number. So I just decided to go with (number) 15 that Carlos used to wear. So I’m staying right there and just keeping everything within family, you know. Roberto: With reggaeton blowing up in Puerto Rico, I was surprised that you have a different genre represented in your walk-up song. 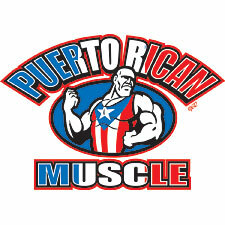 Reymond Fuentes: Reggaeton is big in Puerto Rico, but right now I have a salsa—that’s old school music in Puerto Rico. I got this walk-up song from my dad. It’s my dad’s favorite song, and I’m using it right now. 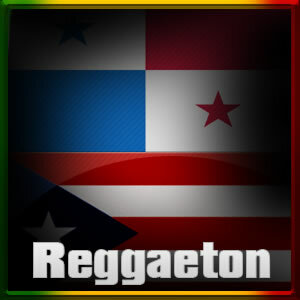 I think I’m going back to reggaeton because I mean it makes me move walking up to the plate and just makes me happy. Roberto: It be long before you make your MLB debut for the SD Padres. Reymond Fuentes: Thank you. That would be awesome. I’m looking forward to that every single day. Roberto: Would you like to be called up to MLB next month when the roster expands to 40? Reymond Fuentes: I would love that. I mean that’s my dream ever since I was a little kid. I just can’t do anything else, but play my best ball here and just wait for that call. Roberto: Are you looking forward to facing cousin Carlos Beltran and the St. Louis Cardinals? Roberto: Thanks for taking time out for us today. Let’s chat again at PETCO in San Diego. Reymond Fuentes: Absolutely, I mean. It’s a great pleasure to speak with MLBforLife.com and I’ll do it anytime when I can. 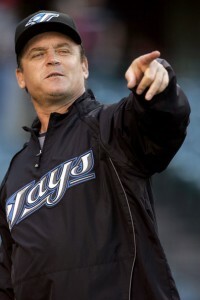 Ex-Blue Jays skipper John Gibbons now enjoys coaching in San Antonio. as he is affectionately known as by his players and coaches, lives up to the Urban Dictionary’s slang definition of “being an incredibly awesome person”. The 50-year-old former big league catcher was a first-round selection by the New York Mets in 1980 from MacArthur High School in San Antonio, Texas. Born in Great Falls, Montana and the son of a military veteran who was stationed at Brooks Air Force Base for 13 years, Gibby moved to San Antonio as a third grader and never looked back. As a youth baseball standout noticed by local fans and scouts alike, Gibbons and his father would attend Missions games at V.J. Keefe Stadium to watch Dodger minor leaguers Fernando Valenzuela, Mike Scioscia and Steve Sax. 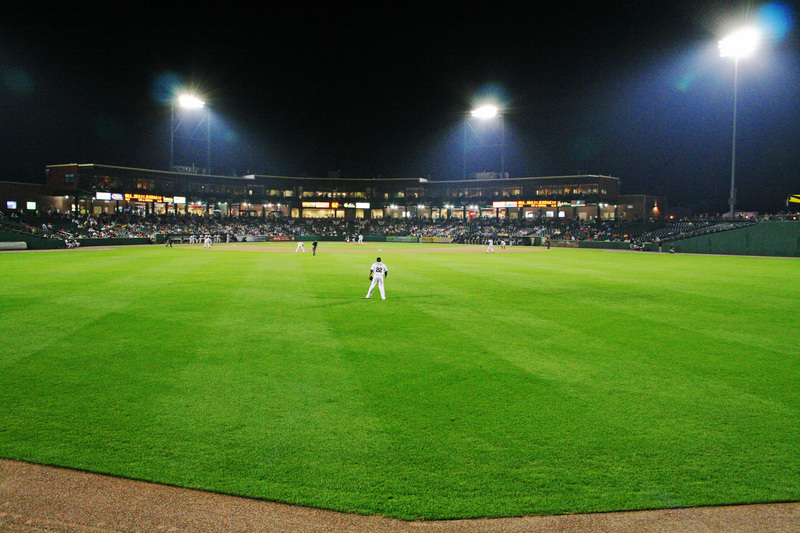 Currently home to the Double-A affiliate for the San Diego Padres and also MiLB’s Minor League Team of the Year in 2011 after winning 94 regular-season games and ultimately capturing the Texas League title–the San Antonio Missions now play at Wolff Stadium under first-year manager John Gibbons, who enjoys knowing his middle school son is nearby. Having spent the last three seasons as the Kansas City Royals’ bench coach, Gibbons has interviewed for recent managerial vacancies with the Mariners, Mets and Pirates but in the end remained close to home as the Missions’ skipper. For the one-time MLB manager, a well-traveled baseball mind for more than three decades, the move represented a decision as much about self as sacrifice goes since the San Antonio native and dedicated father need not give up quality family time. Pitcher Brian Tallet warms up while John Gibbons looks on during during 2008 Jays Spring Training. A.J. Burnett, Shaun Marcum, Dustin McGowan and Jesse Litsch, while juggling a starting line-up which included the likes of Vernon Wells, Alex Rios, Scott Rolen, Aaron Hill, Lyle Overbay and Shannon Stewart. The native Texan led Toronto for four-and-a-half seasons and is credited for putting together the third-highest win total in team history (behind Cito Gaston and Bobby Cox) compiling a 305-305 career record–including an 87-75 campaign in 2006 and a second-place finish in the AL East. in the Toronto Blue Jays bullpen. Gibbons spent seven seasons with the Blue Jays, serving as their bullpen catcher (2002), first-base coach (2002-04), interim manager (2004) and manager (2005-08). Gibby began his coaching career in 1991 as a roving minor league instructor for the New York Mets and spent a total of 12 seasons in the Mets organization (1991-2001) as an instructor, coach and manager. In his first managerial role in 1995, he guided the Kingsport Mets to the Appalachian League Championship with a 48-18 record and as a result was named 1995 Appalachian League Manager of the Year. Having led his teams to the playoffs four times and winning two championships in 1995 and 1996 with the Florida State League’s St. Lucie Mets, the accolades mounted during his seven-year managerial tenure in the Mets system. He was named the Eastern League Manager of the Year and the winner of the Casey Stengel Award as the Mets’ Minor League Manager of the Year in 1998 with Double-A Binghamton. Despite being labeled as a controversial manager and sometimes being misunderstood for his zany antics with players and umpires in Toronto, native Texan and new San Antonio Missions Manager John Gibbons coaches with a deep passion and respect for the game of competitive baseball. John Gibbons takes his experience as a MLB player and manager to the Padres AA San Antonio Missions. 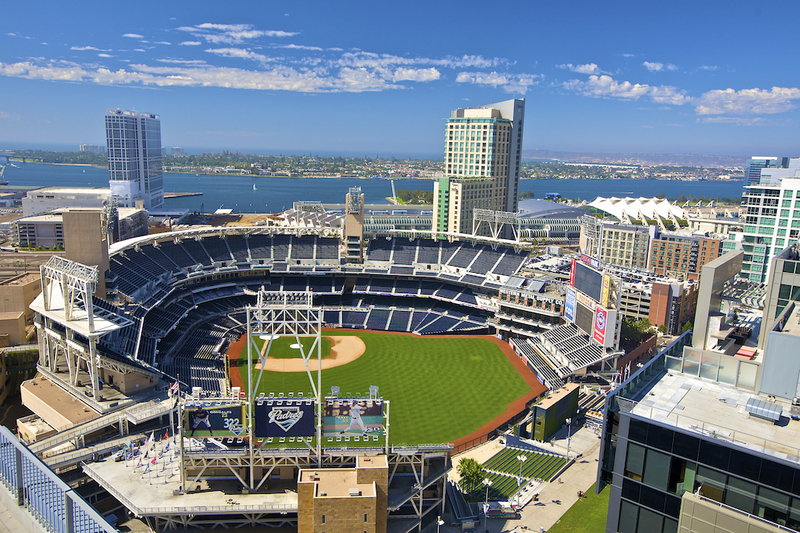 San Diego Padres General Manager Josh Byrnes echoed the sentiment calling Gibbons “a great addition to our organization.” Byrnes said, “You get someone with his resume…it’s a shot in the arm for us. His knowledge, calmness and competitiveness have all proven to be standout qualities. We are lucky to have him.” If anyone could vouch for Gibbons’ temperament, it would have to be his long-time friend J.P. Ricciardi, who roomed with him when both were prospects in the New York Mets system during the early 80’s. After throwing in the towel of his professional baseball playing days, Ricciardi transitioned to the front office. Working as A’s General Manager Billy Beane’s special assistant when Oakland began to implement the “Moneyball” system of using statistical data to unearth hidden gems, Ricciardi was able to parlay his A’s Director of Player Personnel position under Beane into becoming the 2001 Toronto Blue Jays General Manager. 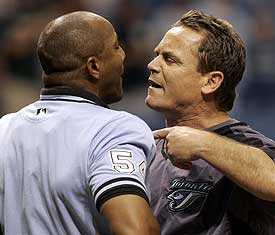 He handed over the reigns of the Jays’ managerial job off to John Gibbons midseason in 2004 after Carlos Tosca was fired. Having built quite the reputation as a bulldog manager for his heated confrontations with players and umpires alike, the veteran MLB player and coach has received a bad rap for his aggressive passion for the game. Ricciardi adamantly denied suggestions that Gibbons has rage issues. “Is he a hot-head? No, not at all,” he said. “That’s the furthest thing from the truth.” Currently serving as special assistant to New York Mets General Manager (and former A’s boss pre-Billy Beane) Sandy Alderson–J.P. Ricciardi remains Gibby’s close friend. Gibbons recently sat down and answered some questions prior to the All-Star break, at which time his San Antonio Missions were struggling and ended the first-half in the cellar of the Texas League South Standings. 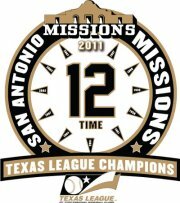 Since then, the Missions have regained last year’s championship form and are currently second in the division in the second-half. 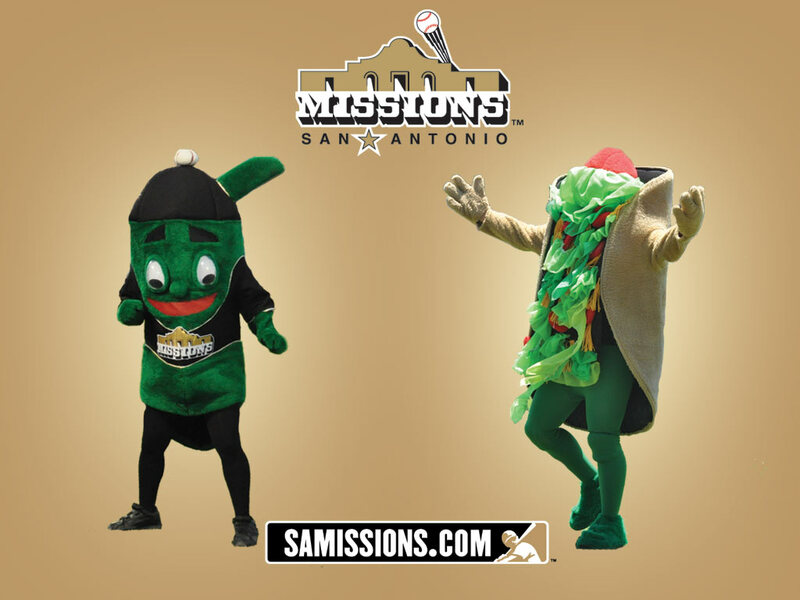 Roberto: How are you doing as the new manager for the San Antonio Missions? John Gibbons: Doing good. you know. We haven’t been playing particularly well, but everyday is a new day, and I always enjoy this group of kinds I have here. When you get a chance to come to the ballpark, make a living doing it, things aren’t all bad. Roberto: As a catcher, you were the New York Mets first-round selection of the June 1980 First-Year Player Draft after playing at San Antonio’s MacArthur High School and earning All-City and All-District honors. You played in 18 major league games between 1984-86 for the Mets and hit .220 (11-for-50) with four doubles, one home run, two RBI and five runs scored. Having Major League Baseball experience, do you believe that your minor league team benefits from your perspective both as manager and former player? John Gibbons: Well, what it does is you can relate to what these guys are going through. 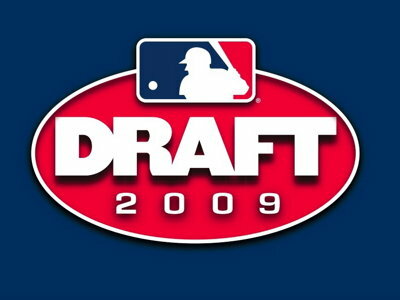 I got drafted high, it wasn’t an easy career, it didn’t last forever. You know, I got there but I spent many years down in the minor leagues so I have been through everything these guys are going to go through. I always told myself that when I got into coaching to not forget how tough it was. It’s easy for me to relate to these guys. 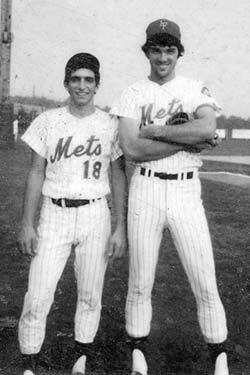 That 1980 year that I was drafted, the Mets had three first round drafts that year. Darryl Strawberry was number one, Billy Beane, the G.M. for the A’s was 23, and I was 24. 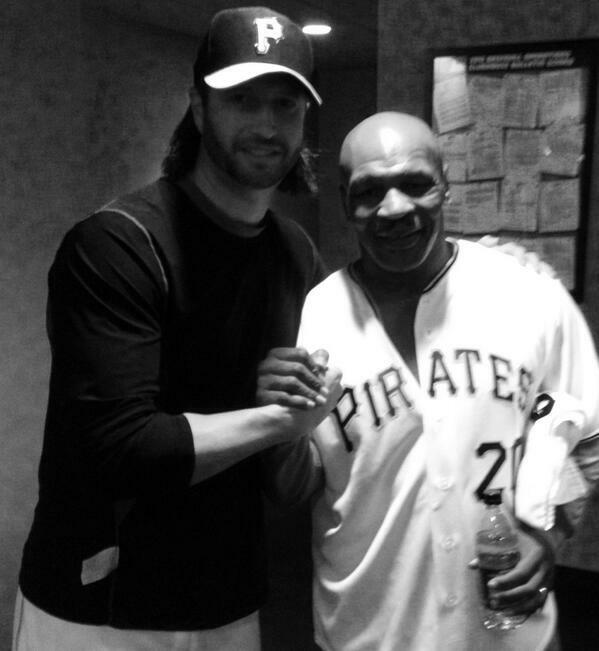 So one went on to be a good player, the other went on to be a G.M. and the other one is a coach. So you never know where you are going to end up. 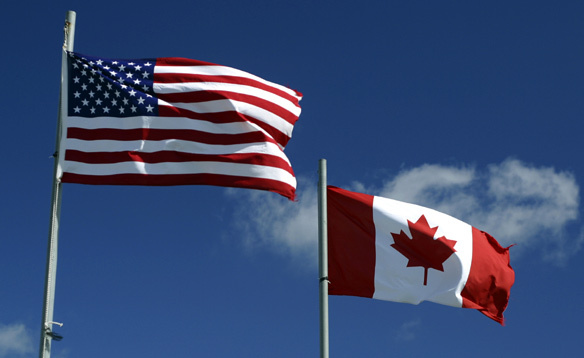 Roberto: Playing home in Toronto as the manager of the Blue Jays, you were fortunate enough to stand twice as long in other ballparks for the playing of both national anthems. John Gibbons: Every night you would hear two. I enjoyed that, but it got to be a little bit long to be honest with you. You know, I loved my time in Toronto. Good people, it’s a lot like an American city, big city. They treated me very well, a majority of them… Some of the them thought, “Here’s a dumb Texan.” At the time, George Bush was in office. Up there a lot of them just liked him, so they tied the two of them together—it seemed like. But it was a lot of fun. I got a chance to manage in the major leagues, and it lasted for almost four years. It’s a thrill I will never forget. Roberto: Did you and your players have to undergo intensive questioning crossing borders? John Gibbons: One thing about it, if you’re involved in Major League Baseball, they know pretty much everything about you–just to get there. Even though you hear stories, people say that customs might be a nightmare. But it wasn’t that bad. We’d go through our own little building. They’d get us through customs pretty quick, and we’d just hop on our plane. So you know it could be a hassle sometimes. So I think one or two times we had to ever go through the major terminal like everyone else. And I remember it happened when we had to play the Baltimore Orioles, and maybe it was because we were flying so close to DC might have been the reason. But other than that, Toronto is a beautiful city and they really treated their people good. Roberto: With young MLB players like Ryan Dempster, Joey Votto and Brett Lawrie along with hot prospects James Paxton and Ryan Kellogg hailing from north of the border, are Canadians making an impact on baseball? John Gibbons: Oh yeah, one thing about those Canadian players that get into baseball—they are really good players! You look at guys like Larry Walker, Justin Morneau, you know what I mean….guys that make it..Jeff Francis, back years ago with Colorado. They’re pretty dog gone good, you know. It’s definitely a proud country. They’re hockey crazed up there… There’s no doubt about it, but they love their Blue Jays. They’re the only team left. They got one team representing the whole country. They’ve been starved for a winner for a while. They’re waiting for another one to come back. Roberto: How have you adapted your managerial style moving from the American to the National League? John Gibbons: It’s a totally different game. I got so used to it in the American League over there (in Toronto). You know, in the American League with the DH all you’re really worried about is handling the pitching staff. The game, the offense is what it is, you know. In the National League, a lot of things change, and the pitchers need to hit. It’s a different style of game. In the National League the game kind of dictates and forces you to make moves too…depending on the score, whether you have to get this guy out or pinch hit for him or what have you. So it’s definitely a different breed of baseball. I was fortunate enough to be in the American League East, which arguably and probably was the strongest division in baseball with some powerhouses, Yankees and Red Sox. So I have seen some pretty good line-ups. I know one thing about this business, you know, pitching and defense win but you also have to be able to slug a little bit too. So it makes good fun. Roberto: As a young baseball player, did you ever imagine managing in MLB? John Gibbons: No, one thing I thought regardless of how my career was going to turn out I wanted to get into coaching some day–whether it be at the high school level, professional level. But at the beginning I never thought that I would set my sights on a major league managing job. Then I got a chance to go back to my original organization, the Mets, as a coach and was in their minor-leagues for a few years as a catching instructor. Then I got a chance to manage and really enjoyed it. Had some success with it and one thing led to another. An old roommate, teammate of mine, J.P. Ricciardi ended up getting the general manager job up there in Toronto, you know. He brought me on board. I was a roving coach there for a few years and then he made a few changes and he gave me a shot at managing. So it’s funny how things work out sometimes even things you don’t expect. 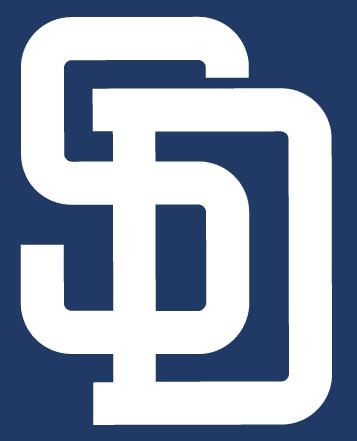 Roberto: During the first-half of the Missions’ season many of your best prospects have been called up because of excellent play and the San Diego Padres’ MLB-leading disabled list. Do you think this may have cost your team the first-half? John Gibbons: You know, that’s the name of the game: to get these guys to the Big Leagues. Winning’s one thing, but also a lot of these guys are so young that we can’t lose sight of developing. The ultimate goal is to harness their skills so when they get to the big leagues they’re good all-around solid players. So we got to keep that in perspective. A number of guys have moved up from this ball club this year, and by that happening it has taken it toll on the team here. But the bottom line is our goal of getting these guys out of here up to the next level and eventually on to the big league team. Roberto: Your reputation of shuffling line-ups in Toronto has followed you in San Antonio. 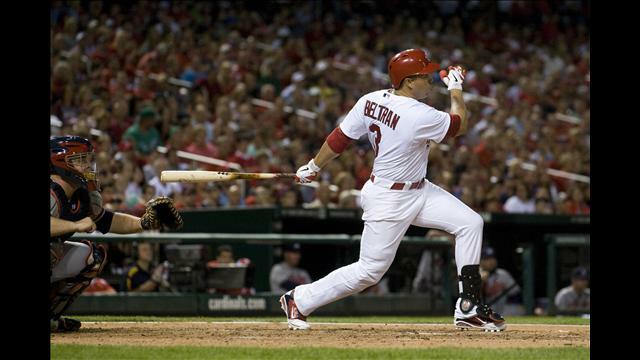 Why have you switched around your leadoff hitters throughout the season? John Gibbons: Originally we started out the season with Jaff Decker as the leadoff guy because the big league team up in San Diego wanted to see him in that role because they pictured him maybe in the near future fitting that role. So we started that. 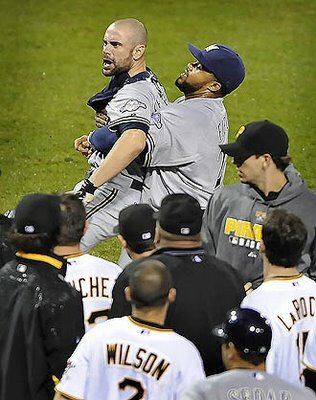 He was little bit banged up, and he was struggling a little bit so we jumped Reymond Fuentes up there. He did a pretty solid job there, Ideally that’s what type of player he needs to become and eventually we think he will become. But with Dino (Dean) Anna now…Dino, he’s having a heck of year. He’s like second in the league in on-base percentage. He’s hitting over .300, and he’s really one of the tougher outs in the league. So we bumped him up there in that role to set the table for us. By doing that we just move Rey down to the nine spot, and it’s kind of like we have two leadoff hitters. He’s just further away down there at the bottom, but they both can fill that role for us very nicely. Right now Anna is playing so well, and he’s one of the better players in the league so he earns that spot. Texas League All-Star Nate Freiman leads the San Antonio Missions with 23 home runs in 2012. Roberto: Your six-foot-seven first baseman Nate Freiman is a power-hitting giant en route to a 30-plus home run season. What does the future hold for this young promising prospect? John Gibbons: I tell you what…this kid he keeps getting better and better and he’s got some kind of power. You know he’s the gentle giant (laughter), if you really want to term him correctly. Nate’s a special guy, and he’s having a tremendous year coming off a big year in (Single) A ball for us last year. It’s kind of refreshing, the kind of the individual he really is. He’s very respectful to individuals, the game. He’s always one of the guys who always does the right thing, you know. I hate to think where we would be right now without him. You know, we see him…he’s just going to get better, better and better. When you got that kind of ability with the bat, there’s no telling how far he’s going to go. Roberto: Recent Texas League All-Star and Home Run Derby Winner Nate Freiman is an octopus defensively who can handle just about anything hit or thrown in the infield. Have you any idea how many errors he has prevented while playing first base? John Gibbons: You know, it’s funny…as big as he is and that wingspan he’s got. We tell these infielders all the time: “Don’t bounce the ball over there. Hell, throw it as high as you want…he’s going to catch it. You’re getting your errors by bouncing them,” (laughter) which isn’t very smart—right? No, he really has done a tremendous job for us, you know. One thing about Nate, he shows up to work. He shows up to play everyday, and he’s definitely one of our leaders. Roberto: Any words of advice for those interested in career as a player or coach in MLB? John Gibbons: Well one thing you know to get on top of this business you have got to work hard. You have got to outwork the other guy. You got to hope for a break, There’s no doubt about it. It’s a tough road so you have got to be dedicated, and you have got to be willing to put in some years. You know, if you want it bad enough, go for it! As far as the coaching end of it, just do what an organization expects. Always try to do the right thing. 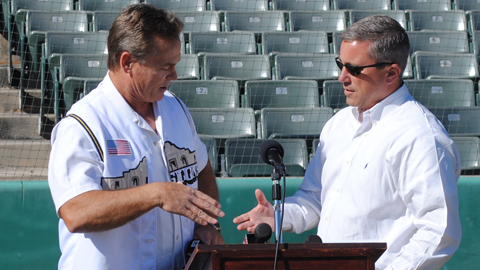 San Antonio Missions GM Dave Gasaway introduces John Gibbons as new manager.